Taphrina alni, Taphrina alni. 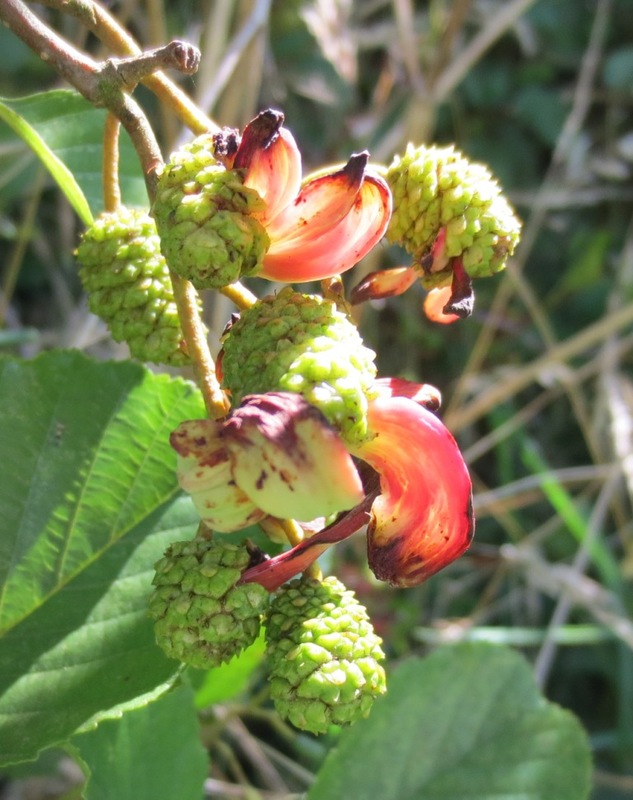 Alder Tongue, an interesting fungal gall found recently (August 2012) on alder trees in the Lye Valley by Judy Webb. Growths emerge green, turn yellow then flame red and then go brown, red tongues very distinctive. Boletus appendiculatus, pores bright lemon yellow, good for the pot but a rare species in the Oxford area. 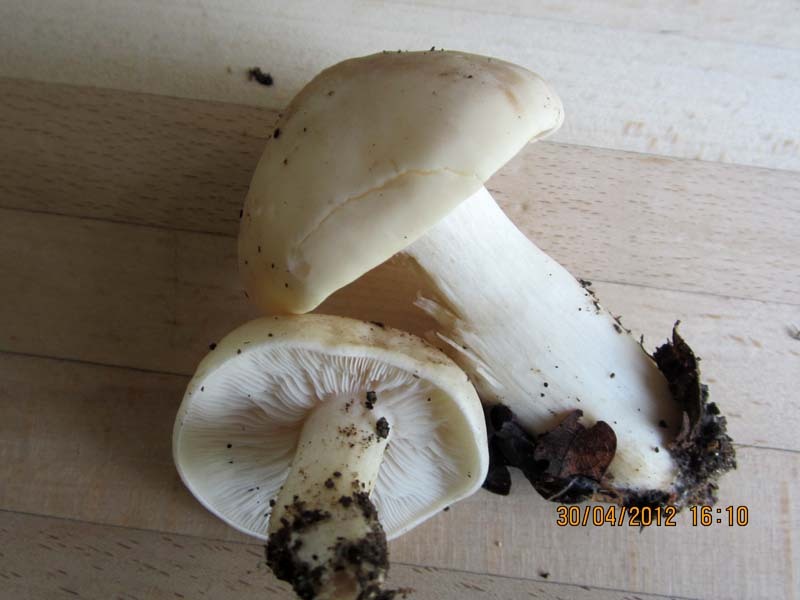 Agaricus bresadolanus uncommon, looks like the common edible mushroom but is distinguished by prominent white branching rhizomorphs at the base of the stipe, Eynsham. 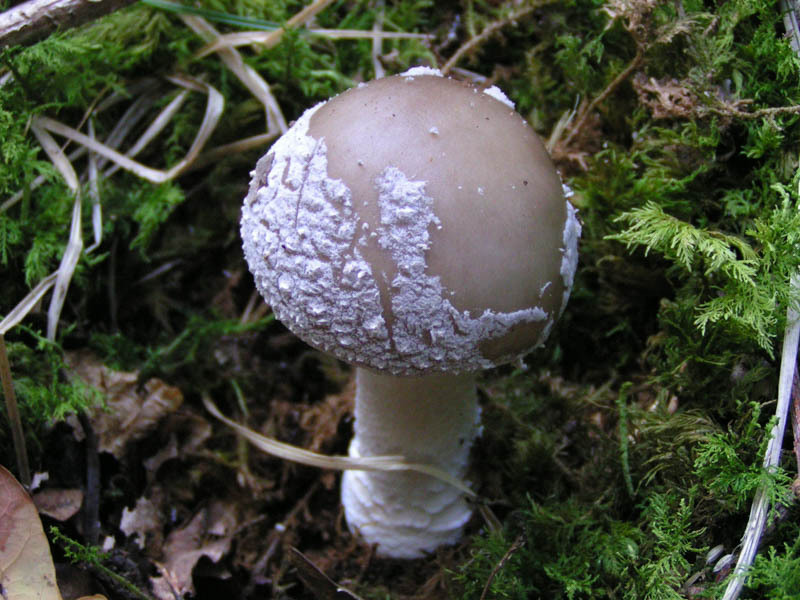 Melanophyllum haematospermum. 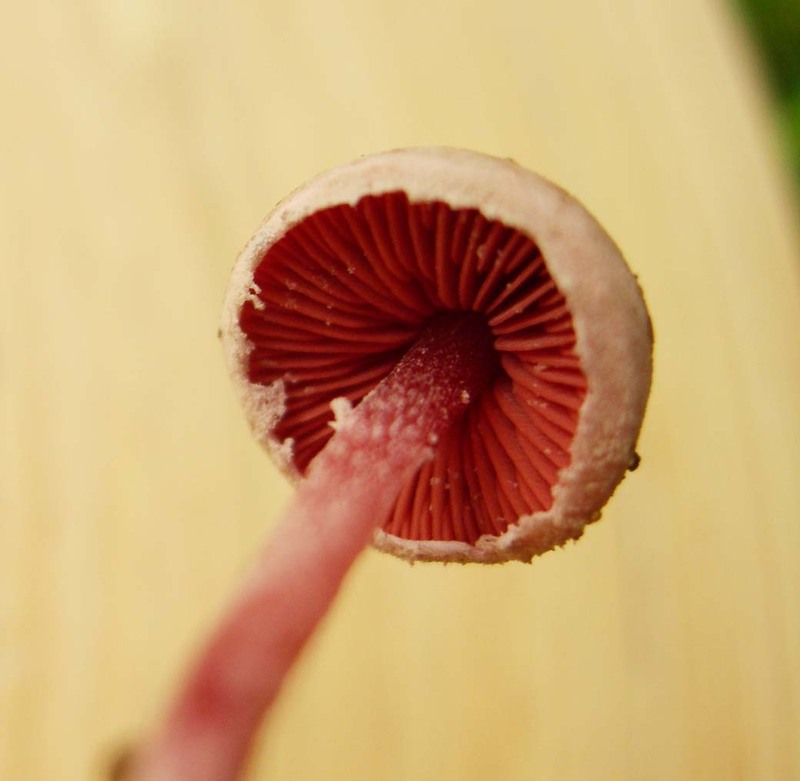 This uncommon fungus is the only British fungus with red spores! Cyathus olla, Birds nest fungus, very small, 1 cm diam, on bark chippings, Albert Park, Abingdon, late October. 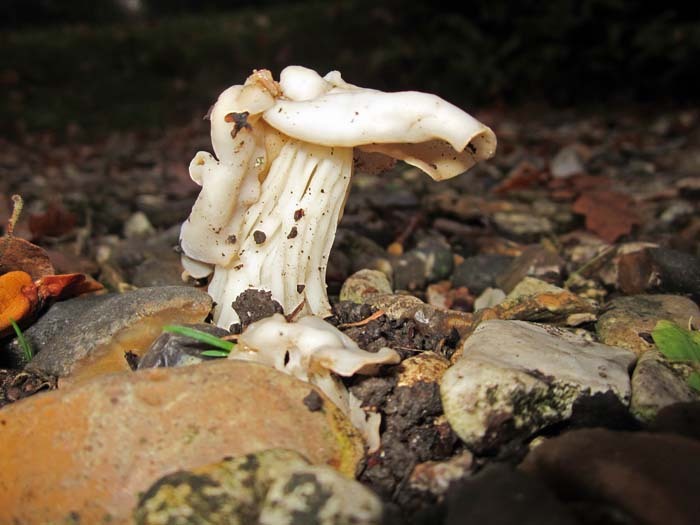 Helvella crispa, White Saddle fungus, found growing through gravel in a driveway. Phylloporia (Phellinus) ribis, uncommon bracket fungus, base of old spindle tree on chalk grassland. Geopora sumneriana, found by Judy Webb, 21 March 2012, poking out of soil on edge of footpath at junction of Girdlestone Road and Old Road in Headington nr Churchill hospital. Amanita muscaria, common name Fly Agaric. 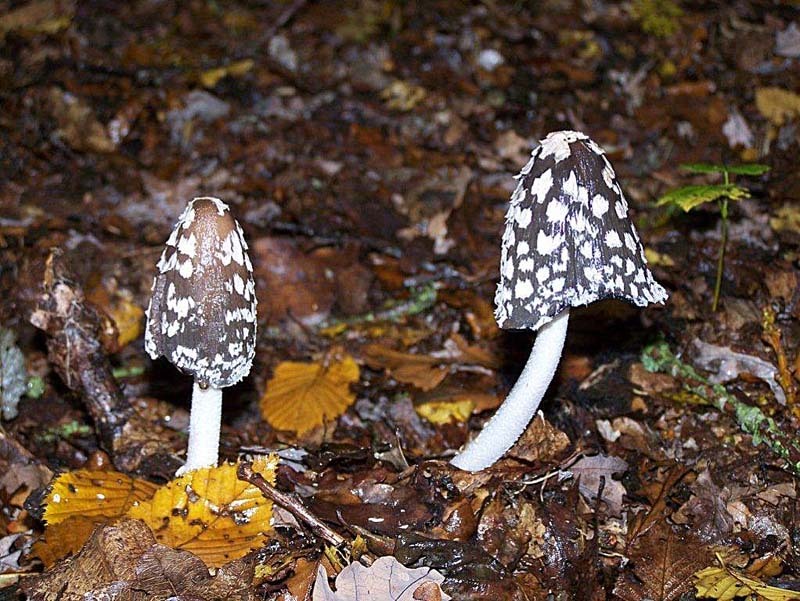 Common under birch, poisonous and hallucinogenic. Kennington 2011. Coprinus picaceus, common name Magpie Inkcap. Found in leaf litter in woodland, Kennington, 2009. 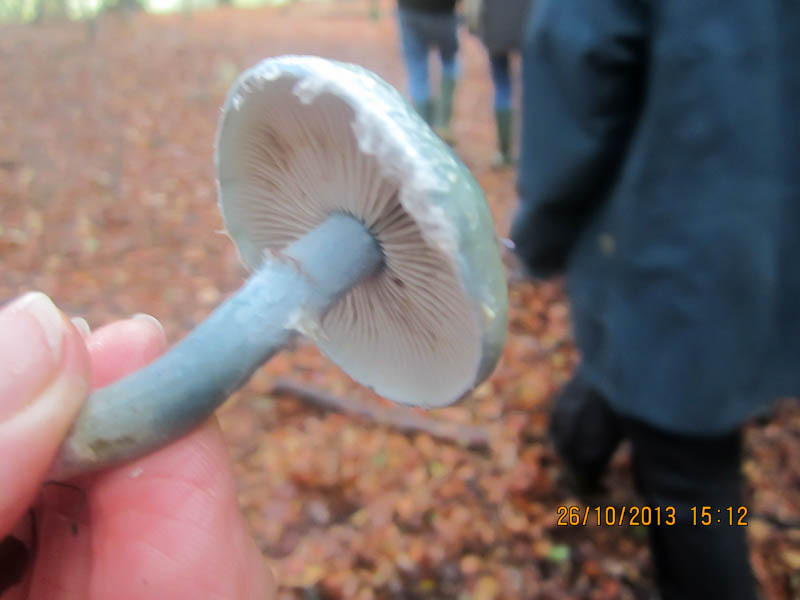 Calocybe gambosa, St George's mushroom. Kennington in grass under ash and oak. Commonly found each year around St Georges Day, April 23. Limacella ochraceolutea, an extremely slimy orange-capped toadstool discovered by Judy Webb in July in leaf litter on the edge of the fen at Cothill NNR (Ruskin Reserve). First record in Oxfordshire. 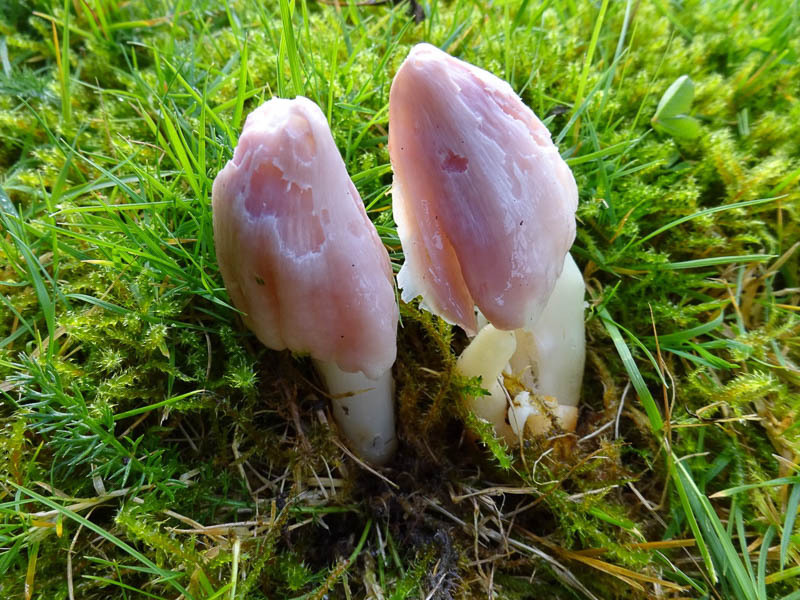 Volvariella pusilla, a pretty little toadstool with gills that are initially white but turn shell pink when taken home. Note the volva at the base. Found by Richard Fortey, Blackhorse Fields September 2011. 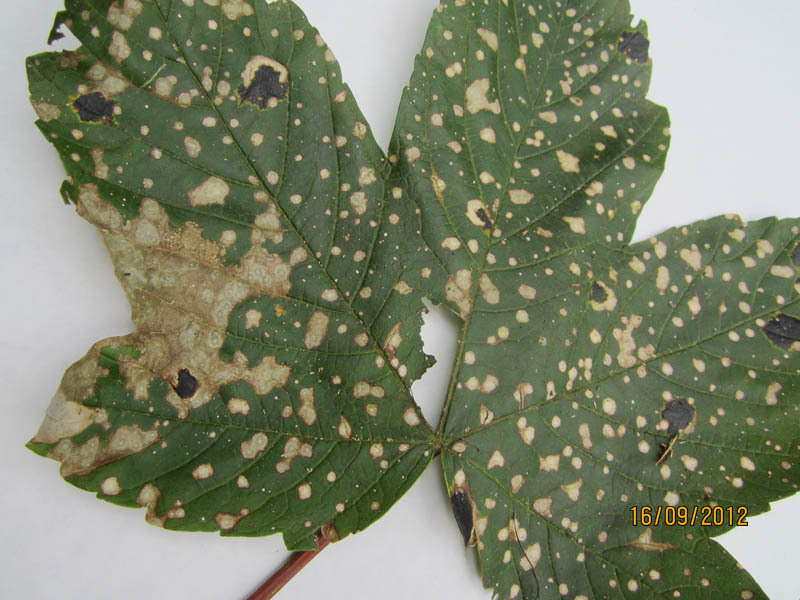 Cristulariella depraedens, brown spots seen on sycamore leaves for the first time in many woods in Oxon in 2012 together with the familiar black spots of Rhytisma acerinum. 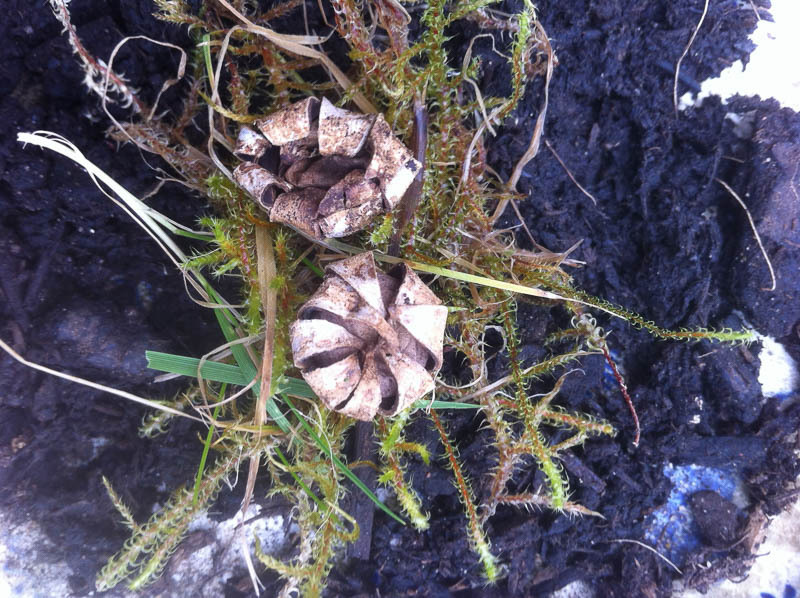 Geastrum triplex, The Collared Earth Star, found under Beech at Aston Rowant Foray, 7 October, 2012. Often, a layer of the exoperidium splits around the perimeter of the spore sac so that it appears to rest in a collar or saucer around the spore sac. 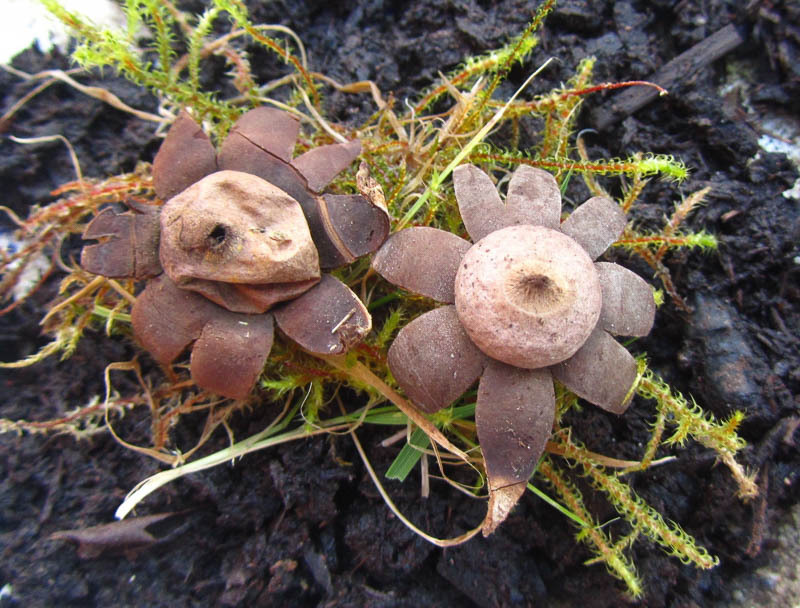 Geastrum fimbriatum, The Sessile Earth Star,found under Beech at Aston Rowant Foray 7 October, 2012. 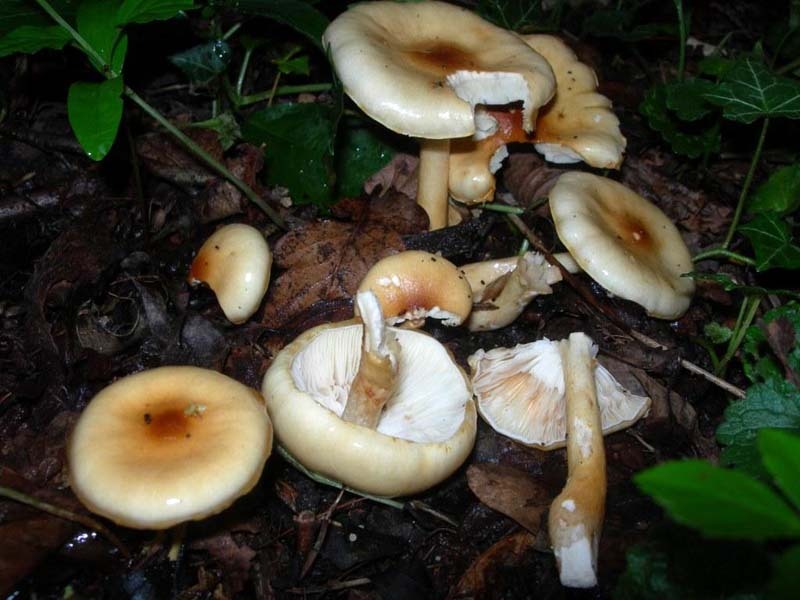 Volvariella surrects, This very rare fungus was found growing on top of Clitocybe nebularis by Richard Fortey, late October 2012, near Lambridge Woods, Henley on Thames. 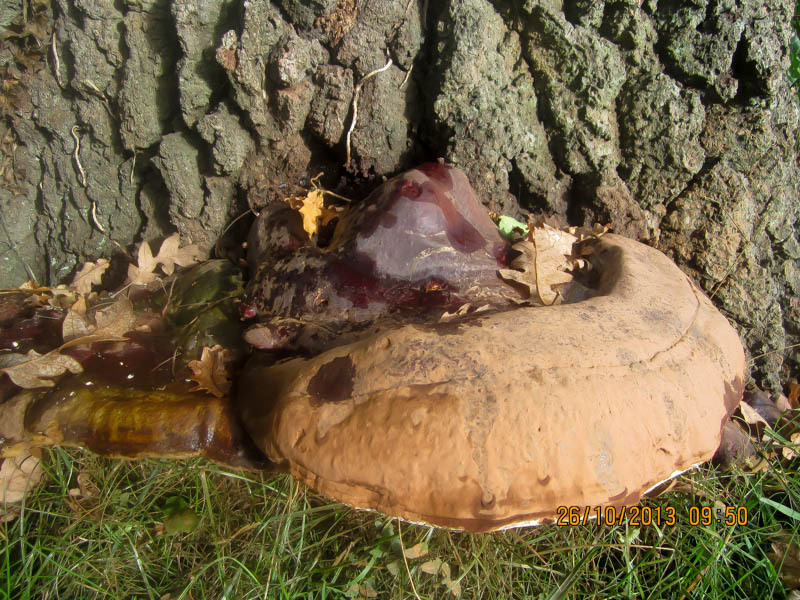 Ganoderma resinaceum, A large (approx 40cm), relatively rare species of Ganoderma found at the base of a mature oak tree on property adjacent to Bagley Wood. 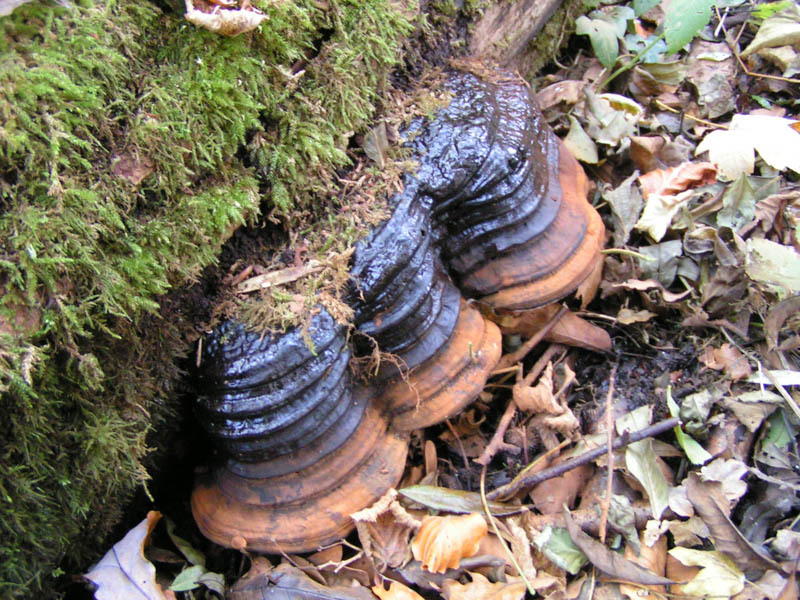 Distinguished from the more common species, Ganoderma lucidum, by lack of a marked stem. 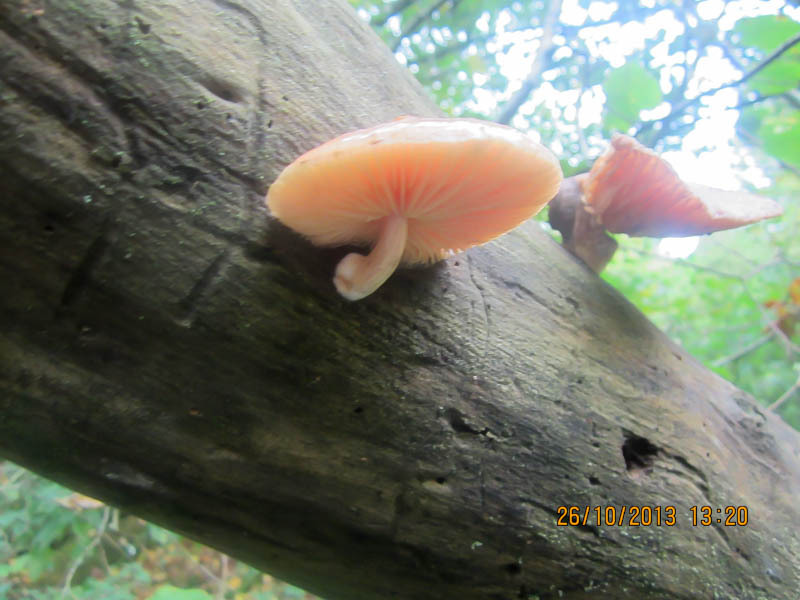 Rhodotus palmatus, sometimes called the Wrinkled Peach because of the obvious wrinkles and peach/apricot colour when young. Found at the Warburg Reserve, October 26, 2013 on Dead Elm wood. 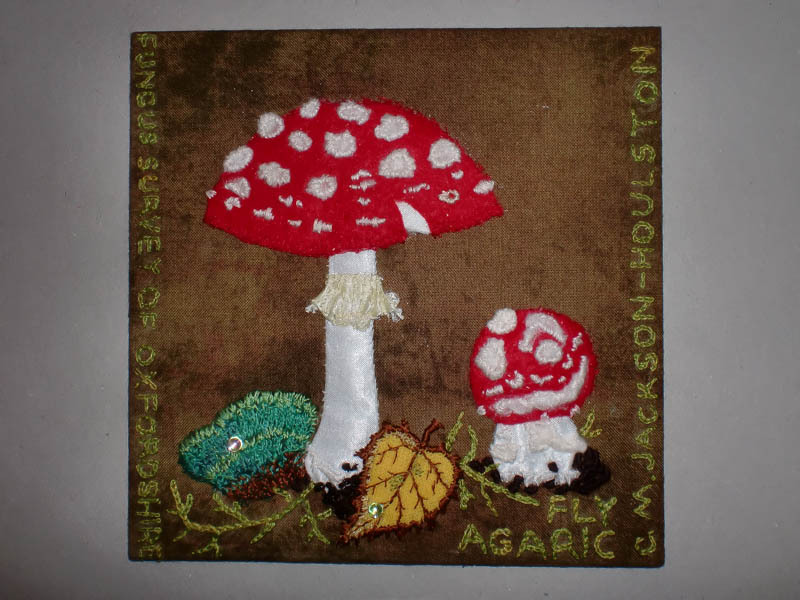 Amanita muscaria, design and stitchwork by Caroline Jackson-Houlston. A contribution to the patch work quilt made by members of Plant Life to foster interest in Wild Flowers and Fungi. 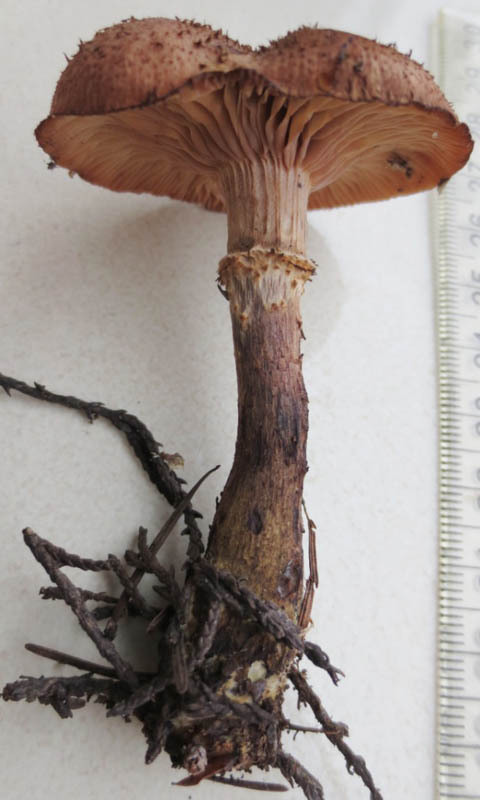 Armillaria gallica, the bulbous Honey fungus, darker and smaller than other species of Armillaria and distinguished by the bulbous base to the stipe. Uncommon in Britain. 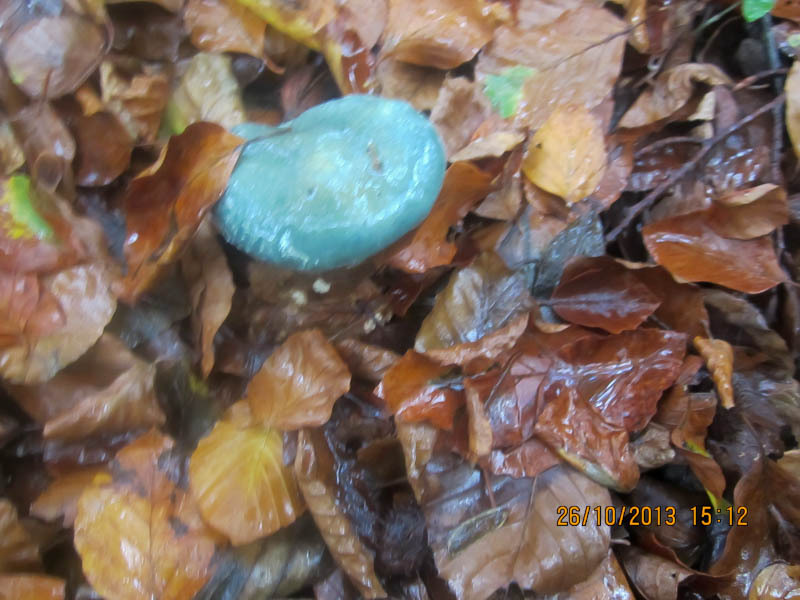 Found by Judy Webb, Nov 13, 2013, in Bagley Wood. Gymnopilus penetrans, Common Rust Gill fungus, found by Judy Webb, Nov 13, 2013 in Bagley Wood on rotting logs and fallen branches under Pine. 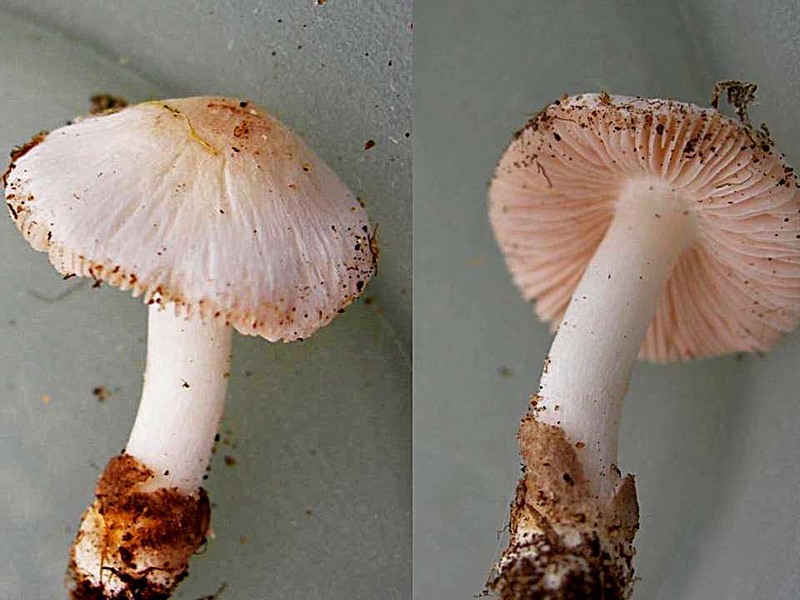 Lepiota felina, Speckled Daperling. 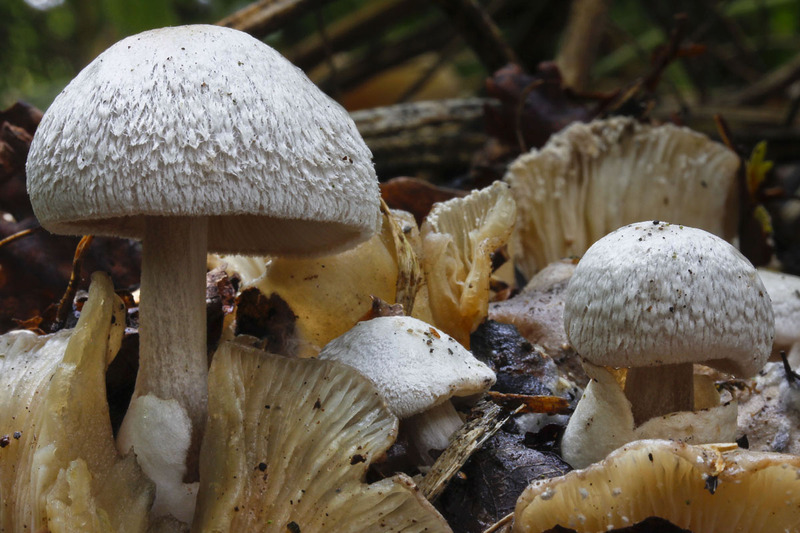 An uncommon, attractive little fungus, found in Bagley Wood, under conifers, by Judy Webb, November 13, 2013. Scutellina sp. 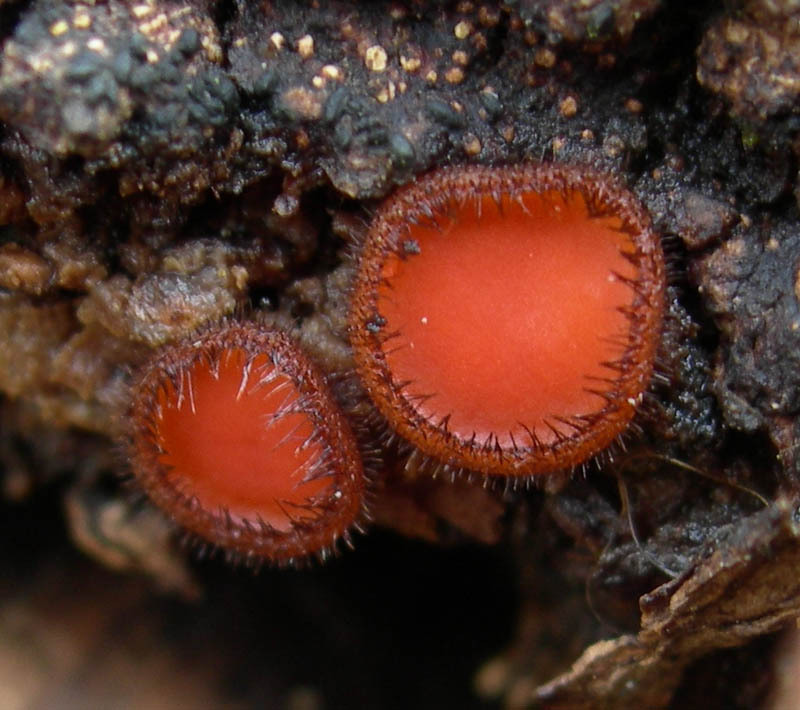 The Eyelash fungus, so called because of the hairs surrounding the cup of this little fungus which is an Ascomycete. 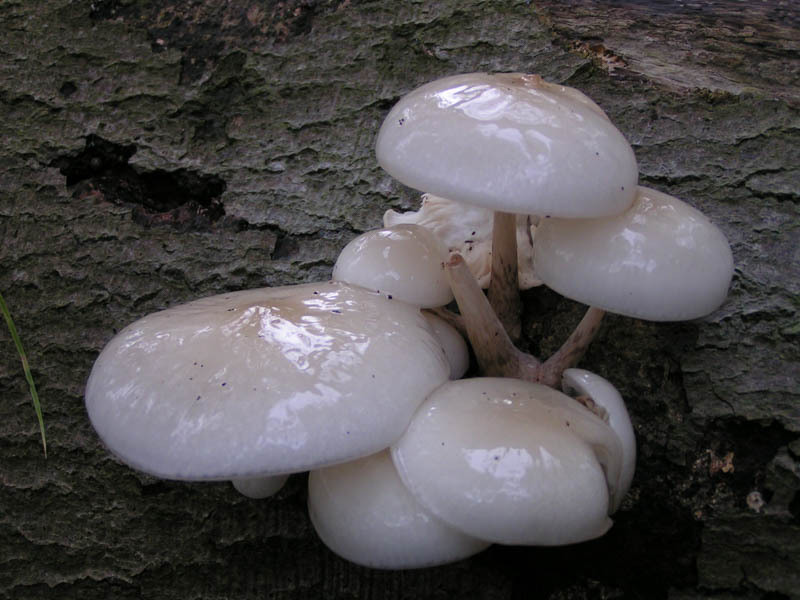 Usually found on damp wood or damp soil. 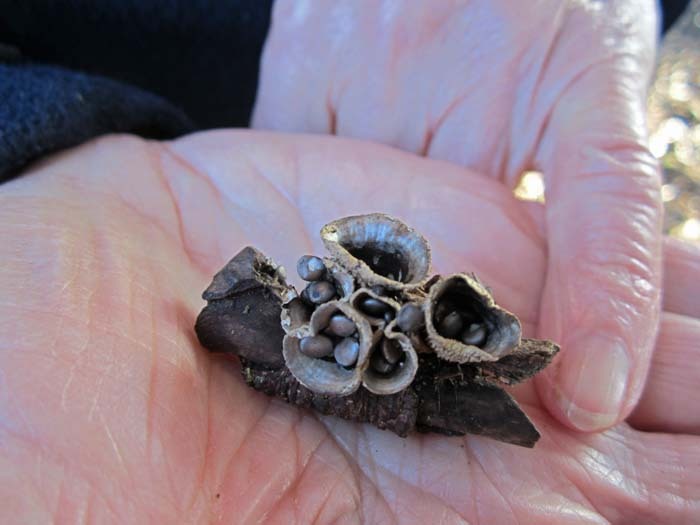 This one, was found by Judy Webb's son on the upper surface of the trunk of a fallen Ash tree in the garden of Molly Dewey, March 3, 2007. Amanita pantherina ( Panther cap) Found in mixed woodlands, dangerous-toxic but not usually fatal, Sodium hydroxide turns the cap yellow. Fomes fomentarius (Hoof fungus or Tinder bracket) Associated with deciduous trees commonly on beech in S. England and Birch in Scotland. Underside cream with rounded pores. 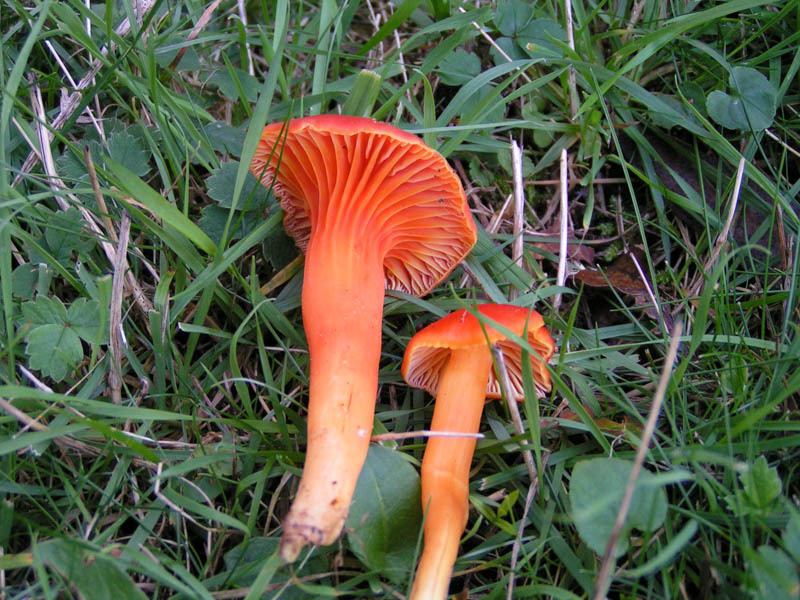 Hygrocybe cantherellus (Goblet Waxcap) small, reddish or orange waxcap with dry scurfy cap, found in unimproved grassland. 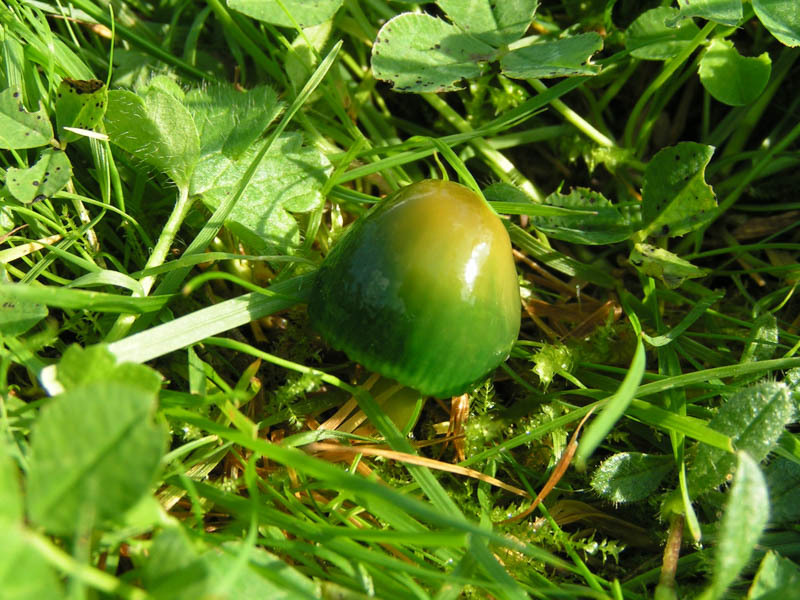 Hygrocybe psitticina (Parrot waxcap) Extremely variable in colour but green tint almost always present. Widespread and common in unimproved grassland. Oudemansiella mucida (Porcelain fungus) in clusters on dying broad leaf trees predominantly on Beech. 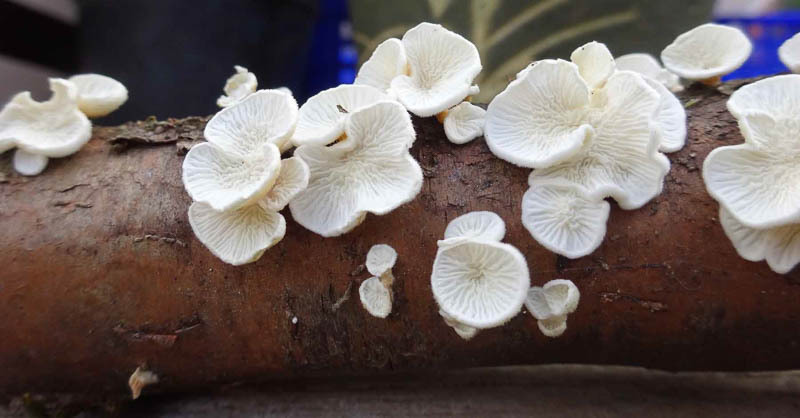 White glistening, mucoid caps. 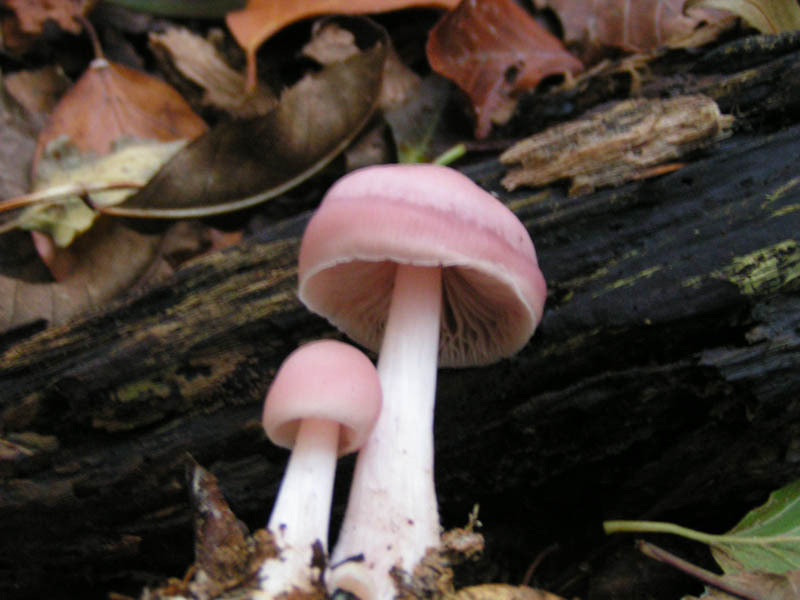 Mycena pura (Lilac bonnet) variable in size and colour lilac to pink with strong smell of raddish. Widespread and common. 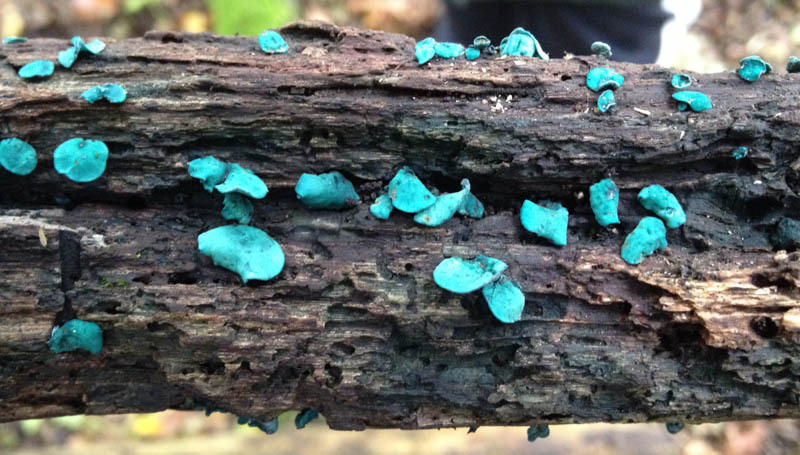 Chlorociboria aeruginascens (Green elf cup or greenwood) Generally found on fallen, rotten branches of wood of oak. 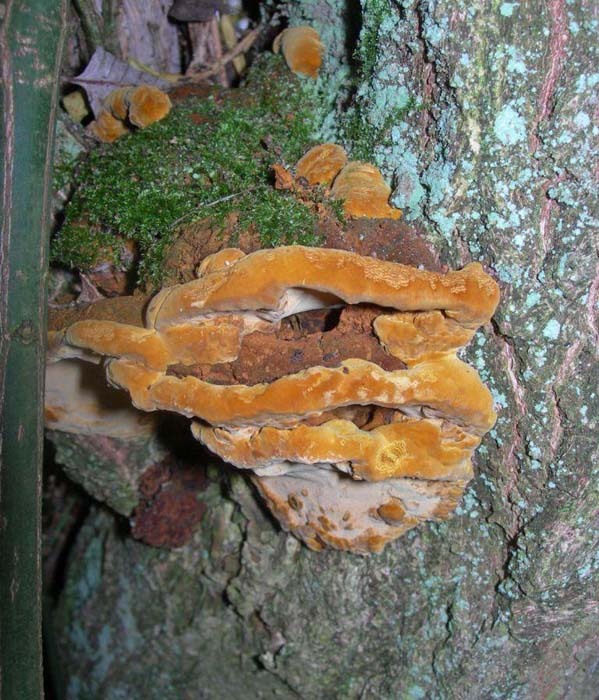 This species contains a quinone pigment called xylindein, which gives infected wood a characteristic bluish-green stain, it is used in Tunbridge ware. Plicatura crispa found by Richard Fortey in Harpsden Wood on fallen branch of Cherry, Nov 5 2016. 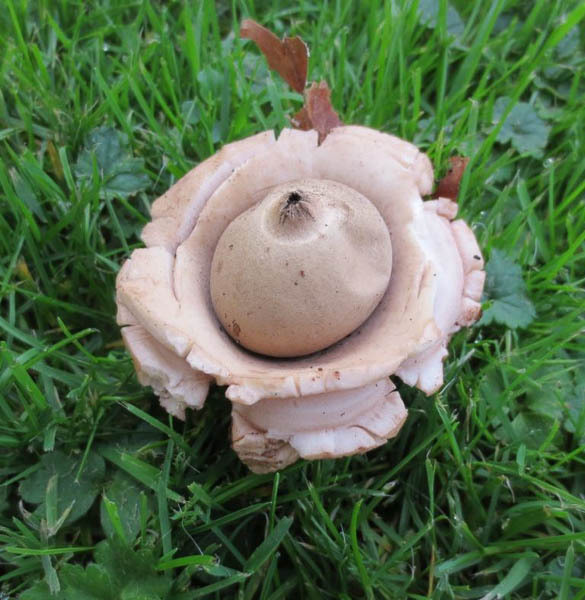 Essentially a Scottish fungus, only once reported south of York. 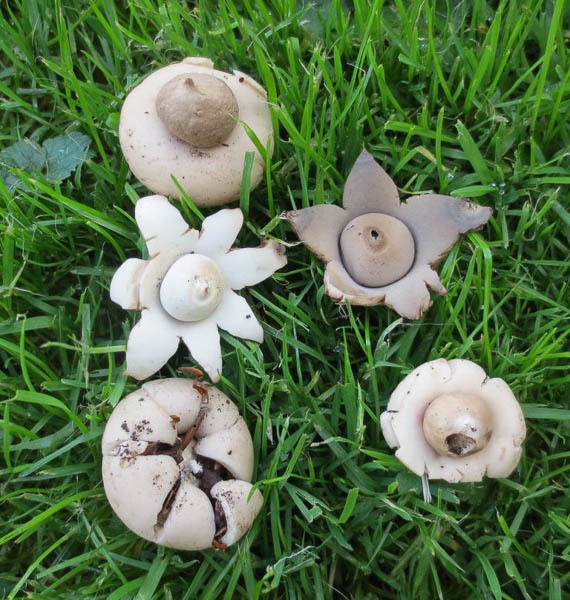 Geastrum corollinus Small, rare (Red data listed species, new to Oxon) Earth Star known as the Weather Earthstar. It was found by Julia Huggins in a box grove (Buxus sempervirens) at Shirburn Hill on April 16 2016. 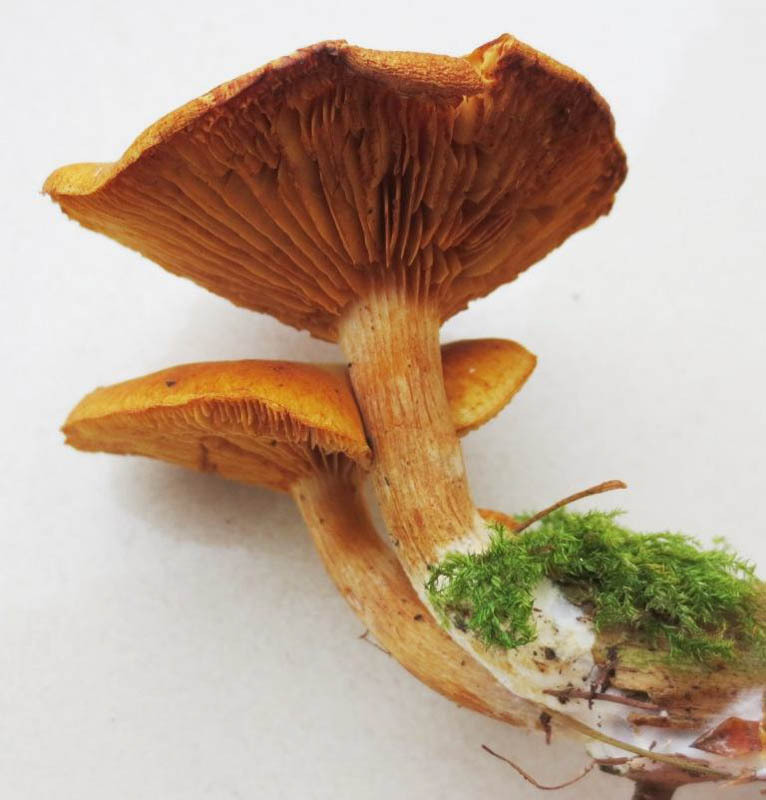 It is closed when dry, when wet 6-10 star-lke rays of the outer layer uncurl and push against surrounding leaves raising the inner spore-filled sac above the surrounding debris.